While it may not be Dumbledore and Potter, The House with a Clock in Its Walls does a fine job of conjuring up 105 minutes of fun. I have a Love-Hate relationship with Eli Roth. I can count the number of movies of his, which I have actually enjoyed, on 2 fingers. On the other hand, I think his enthusiasm and love for, and knowledge of, classic horror, and Genre movies, in general, is really admirable. Not to mention, he really seems like a genuinely good guy. But back to his movie. I have been burned a few too many times but, thankfully, this is not one of those times. The House with a Clock in Its Walls, is Eli's PG rated foray into the world of family-friendly, creepiness. And, for the most part, it works. And, if I'm being honest, it works better than the last few films he has directed. For those that are unfamiliar with it, the movie is adapted from the book, of the same name, written in 1973 by John Bellairs. Lewis Barnavelt (Owen Vaccaro), after losing his parents, is sent to Michigan to live with his uncle Jonathan (Jack Black). He discovers his uncle is a warlock and enters a world of magic and sorcery. But this power is not limited to good people: Lewis learns of Isaac Izard (Kyle MacLachlan), an evil wizard who constructed a magical clock with black magic, as long as it exists it will keep ticking, counting down to doomsday. He died before he could finish the clock, but he hid the clock in his house, where Uncle Jonathan now lives. Now Lewis, Jonathan, and his trusted friend Florence Zimmerman (Cate Blanchett) must find the clock before it finishes its countdown and ends the world. In this fantasy, yet character-centric film, Roth does a solid job of blending the fantastic with the commonplace, and delivers a fast-paced tale of a young boy, coming to terms with big issues, such as life and death, self-esteem and the need for acceptance, and, ultimately, the threat of Armageddon. Eli Roth manages to pull it all off with some deft special effects wizardry that astounds but doesn't diminish the overall story. The main thing that helps this film, however, is the solid acting job, and good chemistry of the actors. Black and Blanchett have a witty repartee, which conveys a believable, friendship. They love to verbally spar with each other, and as anyone with true friends knows, they are always more fun when the sniping is quick, merciless and done with a smile. As for Vaccaro, he brings a melancholy, sadness to his loner role, and yet, leaves you cheering for his success, instead of feeling too sorry for him. Not bad for a 12-year-old actor, to hold his own with a Golden Globe Nominee (Black) and a 2 time Academy Award winner (Blanchett). The movie itself is a 4K marvel, Upscaled 4K (2160p) Aspect ratio: 2.39:1, I found myself really engrossed in looking at all the colors and textures in the House, as well as Cate Blanchett's wardrobe. I don't think I have ever seen that many shades of purple or violet before. The depth of field, as well as the sharpness and clarity of the period costumes (set in 1955), were incredible. This movie looks gorgeous, from the animatronic enemies to the vicious, slime-spewing Pumpkins, I couldn't take my eyes off the screen. As for the sound, the Dolby Atmos gives new meaning to the word immersive. From the enveloping sounds of the ticking clocks, to the secret door opening of scraping stone on stone, to the spells hurled from one Warlock to another, or the scene in the Library when a flock of bat-books swoops down to attack Lewis, this delivers a heft and ambience that really brings the atmosphere to life. Even the dialog is handled well, up front and clear. This presentation also comes summoned, with a bevy of sorcerous extras, hours and hours of behind the scenes, making of, interviews and much, much more. To mention a few, Alternate Opening and Ending scenes, Deleted Scenes, Gag Reel (who doesn't love Blooper Reels?) Tic Toc: Bringing the book to life, for fans of the novels. The extras are never-ending on this one, honestly, this is what I come to expect from modern movie releases. When you spend money on physical media, I want to see this level of dedication to the fans. While not entirely without its flaws, this film delivers on its promise - a fun, mildly creepy, and family-friendly tale. The story may be a tad predictable but it offers a fine gateway for Horror fans to introduce young adults into the finer world of Genre films, and it does so without the gore and grue, Mr. Roth has been famous for. While they may not be Dumbledore and Potter, they do a fine job of conjuring up 105 minutes of fun. 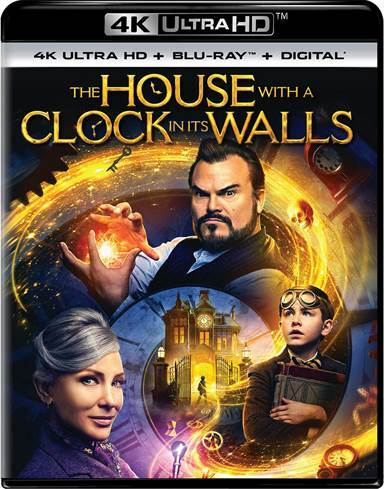 Download The House with a Clock in Its Walls from the iTunes Store in Digial HD. For more information about The House with a Clock in Its Walls visit the FlickDirect Movie Database.